The king salmon looks like cod fish for a second there. Use fresh ones to steam, it's better, because you definitely don't like the fishy smell, right? I often pan fry the frozen fish steaks or bake them. Exactly, you're so right. It looks like cod, their flesh is softer than cod's though. p.s. and i definitely agree that "魚放在餐檯上，就感到那餐很豐富"
Cod is a great choice. My mum used to steam cod in this way. It's very yummy. Get the smaller cods, because the meat of large ones are very tough. Thanks for another great recipe! 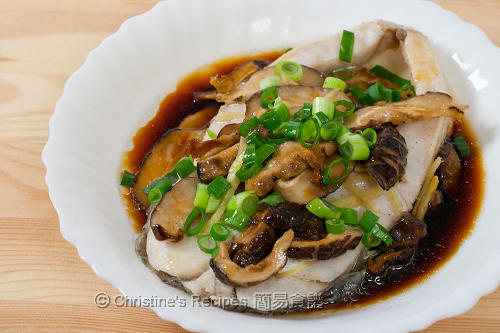 I normally steam the Shiitake mushrooms when cooking the rice in the rice cooker. It saves a bit of time.